Dr. Feller is Board-Certified in Internal Medicine. He’s a graduate of Columbia University in both undergraduate school and Medical School and completed his Residency at Albert Einstein University in the Bronx, NY. 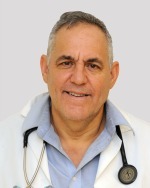 He had his own private practice in Internal Medicine in New Jersey for 30 years. Dr. Feller was very interested in working in western North Dakota and about a year ago began working in Watford City. In the last year he has worked ER & Hospital so he is very excited to join us here in Bowman and have the opportunity to have a clinic practice. Dr. Feller will see all patients but he has a special interest in managing chronic diseases such as Diabetes, Hypertension, COPD, Chronic Kidney Disease and other chronic illnesses. Click Here to see Dr. Feller's Schedule.